Dundee cake is a popular traditional Scottish fruit cake. 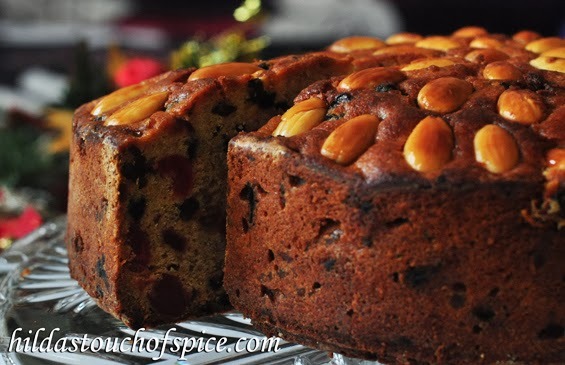 Currants, raisins, sultanas, ground almonds and cherries are mainly used to prepare this fruit loaded cake. 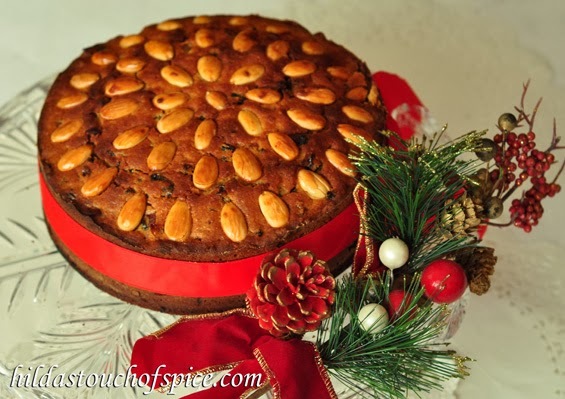 The true beauty of this cake is the decoration of blanched and peeled whole almonds arranged beautifully in tight concentric circles. This pattern of studded almonds looks elegantly pretty. When you slice the cake, it looks gorgeous within. The lovely red glace cherries and the dark fruit look like jewels. The sweet glaze brushed on top of the cake makes the cake look stunning and glossy. You can’t help but admire and feast with your eyes before you enjoy every bite of this cake. If you are thinking of serving this cake to children then skip the alcohol. I added whiskey to this cake to make it a special for Christmas. 175 gms. unsalted Butter @ room temp. Mix together one tablespoon caster sugar with one tablespoon milk. Grease an 8 inch spring form pan with butter. Line the tin with parchment if you like. Soak the chopped dry fruits, orange peel and glace cherries in 2 tbsps. whiskey for about 2 hours. Sift together maida & baking powder. In a sufficiently large bowl, beat together butter and sugar until light and fluffy. Whisk in the grated lime zest. Beat in one egg at a time until all the eggs are used. Add the marmalade or apricot preserve and beat in until blended. Whisk in the flour a little at a time until all the flour is incorporated. Mix in all the soaked chopped dry fruits. If the batter is too stiff, stir in a few tablespoons of milk to get a dropping consistency. Spoon the batter into a 8 inch spring form cake tin. Smoothen and level the batter in the tin. Tap the tin very lightly to release air pockets if any. 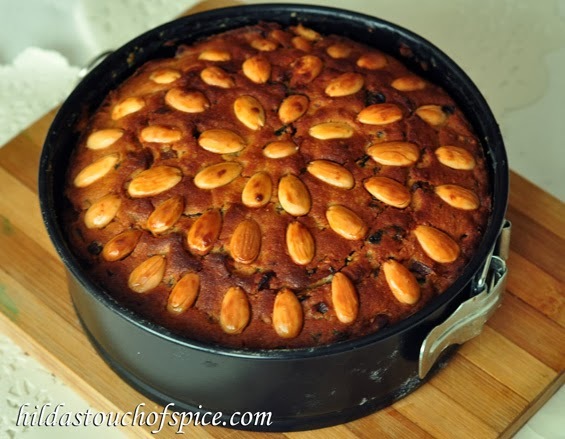 Arrange the whole blanched almonds on the cake in a pattern before baking or after baking for 40 mins. It depends on your preference. To get the lovely pattern, start arranging the rounded ends of the almonds outwards, beginning from the edge. You have to arrange them in tight concentric circles over the batter. When you place them, just press the almonds gently into the batter; not too much or they will sink in the cake! Bake covered with a piece of foil or parchment paper for about 40 mins. in a pre-heated oven at 170C. Place a bowl of hot water next to the cake tin. Lower the temperature to 150C after 40 mins. and bake uncovered until the cake is almost done for about 1 ½ hours. (The timing may vary depending on your oven). Regularly check to see that the top of the cake does not brown quickly and too much. If so cover the top with a foil. Insert a wooden skewer to check if done. When you find a little batter sticking to the tooth pick or skewer; take the cake out from the oven. Use a pastry brush to glaze the top of the entire cake. Pop the cake back in the oven to bake further for another 10-12 mins. or until done. The baked cake should be firm and springy to the touch and the skewer inserted in the center of the cake should come out clean. Transfer the baked cake to cool for 10 mins on a wire rack. Remove the cooled cake from the tin and place on a cling film. Wrap in cling film and refrigerate for at least 2 days before slicing and eating or unwrap, slice and enjoy at Christmas!